Players are requested to present themselves to the starter at least 15 minutes before start time. Fixtures and Results for all competitions can be view by logging into OneGolf. 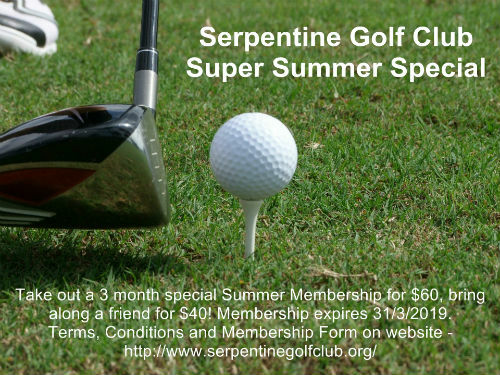 Serpentine and Districts Golf Club is a Private Golf Club. Members of the public are welcome to play the course at times when there are no competitions being played. Please check the times for public access in the visitors section of the Web Site. The course is closed to the public when the club is hosting major events. A sign at the entrance to the car park is used to indicate when the course is closed. The Club House is unattended most of the time all inquiries should be directed to the Club Secretary. For the past five years golf’s governing bodies have been working on a makeover of the Rules of Golf. And here they are. As of 1 January 2019, the results of the first fundamental Rules review in 34 years come into effect. So with the aid of these simple videos, we present the main changes. These videos and explanations are expected to have the most impact on the game and be of most interest to golfers. They’re organised into eight categories and, within each item, you will find the main reasons for the change. And if you would like to read about all of the changes, please click here. But remember, they aren’t in place until the new year, but it will pay to become familiar with them in advance.